The market continued its march higher today with the index opening firm before rallying into a midday high. The typical Friday afternoon lethargy then took hold and the market drifted into the close. 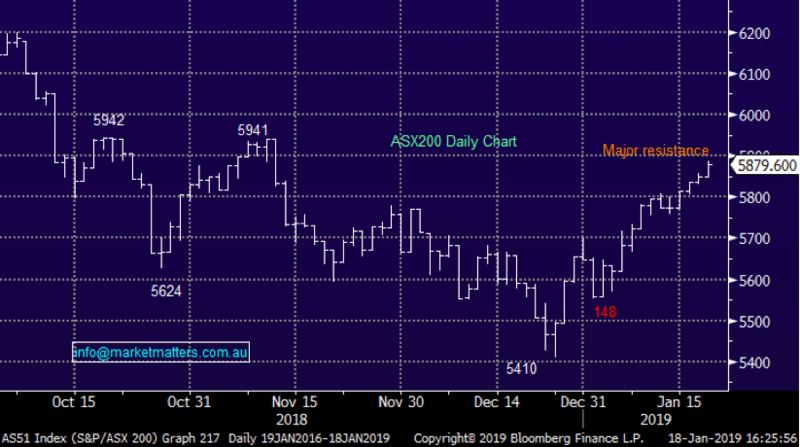 Asian market provided a positive backdrop with shares in Hong Kong up around 1% which fed into some buying of US Futures – they traded mostly higher during our time zone. 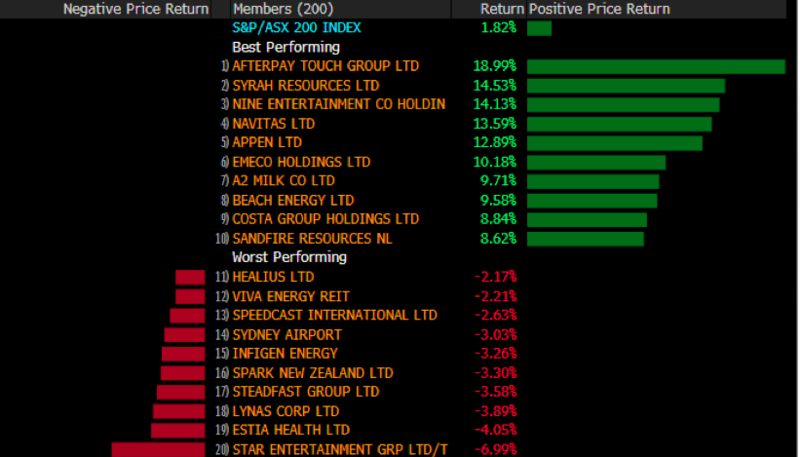 Technology stocks the standout today thanks to a bumper update from Afterpay Touch (ASX:APT) – more on that below - and that seemed to feed through to the other tech names. 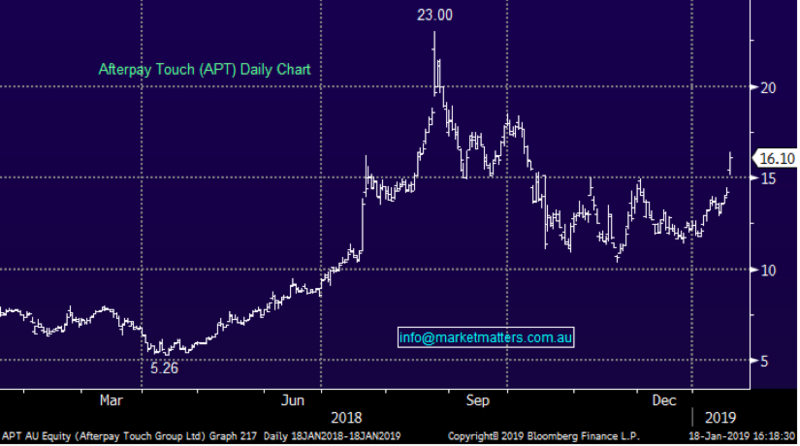 Appen (ASX:APX) which resides in our Platinum portfolio was strong once it broke through $15, adding 4.98% on the session to close at $15.59. Overall today, the index closed up +29points or +0.50% to 5879 and was up +1.82% for the week. Dow Futures are trading up +18 points / +0.34%. All sectors closed higher today highlighting the broad based nature of the buying. Worth noting though, the market is now approaching major resistance, around the 5950 / 6000 level. 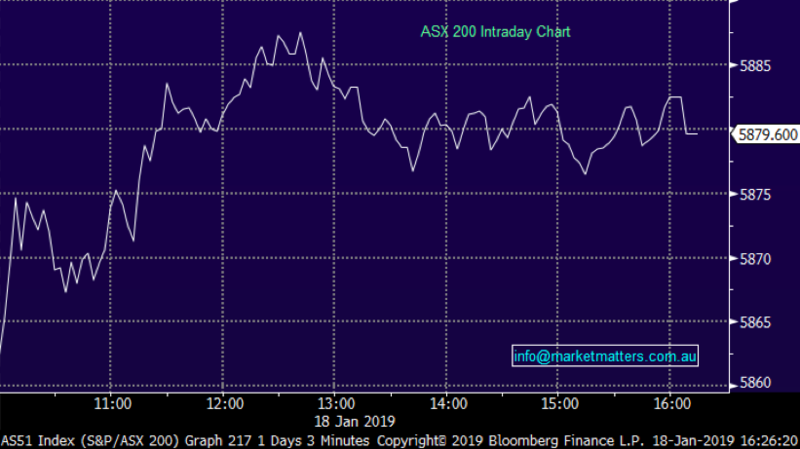 Afterpay Touch (ASX: APT) $16.10 / + 12.98%; The best mover in the 200 today is Afterpay which closed up nearly 13% on the day. The alternative payments company has soared on an impressive business update which has seen sales grow 240% since the first half of FY18. Producing another record month in December 2018, driven in part by retail Christmas spend but also a number of new retailers coming onto the platform as well as continued customer growth. The update also noted that $260m of sales were generated in the US, Afterpay’s biggest focus of growth in the immediate future. 650,000 new customers were added in the States over the half. Afterpay is set to face a Senate committee next week as regulators look to catch up on the loop holes these lending companies have utilized. Evidence here will be key to the long term growth of Afterpay locally, however the company seems to be on a huge overseas growth trajectory, reducing its reliance on the domestic market / and thus exposure to domestic regulatory changes.